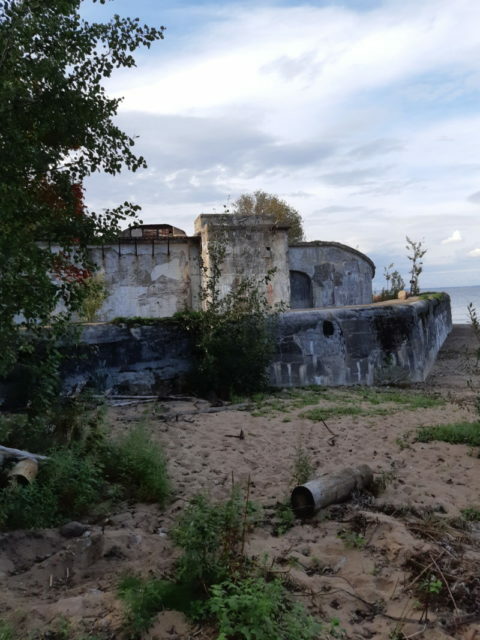 Hidden from view by a hardly penetrable thicket of wild-growing trees, Reef Fort on Kotlin Island can by no means be classified as one of Saint Petersburg’s well-known tourist destinations. It is rarely a recommendation for local inhabitants, so it is unsurprising that it does not feature in international guidebooks. A regular city bus serves a local stop near the somewhat better-known Schanz Fort 10 to 12 times daily. It is here that the protected forest area starts, so no motor vehicles are allowed further: visitors are only permitted to travel on foot or by bike. 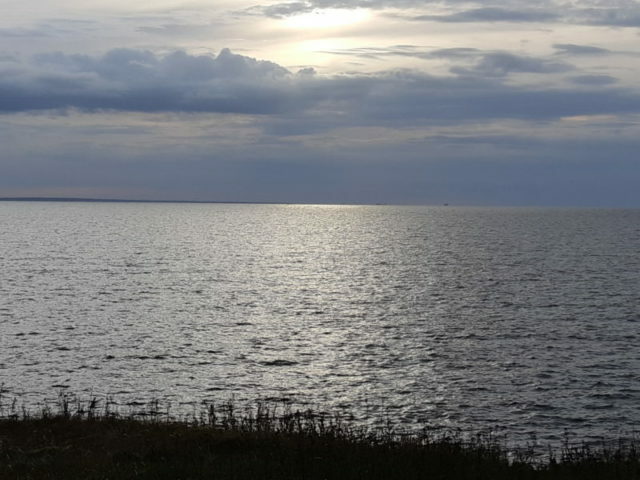 It is worthwhile walking along the waters of the Finnish gulf, especially on a nice summer or early autumn day. It is better still if you know that at the end of your journey, the gate will fling open and you will be let inside. 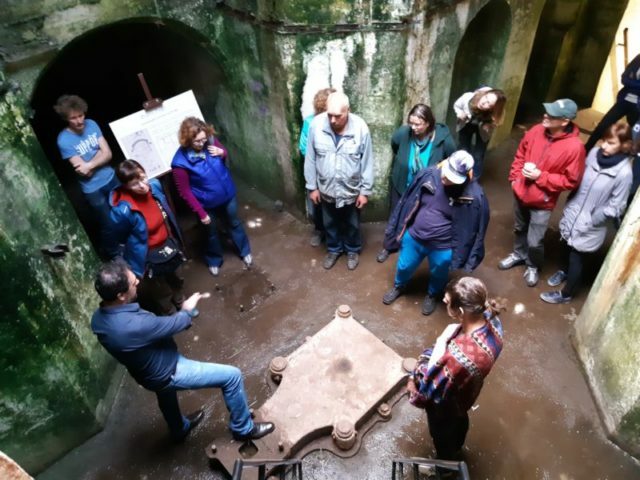 The site is currently undergoing reconstruction works, so only special guided tours led by the fort superintendents are possible. I will explain later why visits on the sly might be a bad idea. There are dozens of us: journalists, university teachers, artists, and sociologists. We are standing in front of the security cubicle muttering the magic passwords: Kirill Korobov and Stanislav Vorobyev. It is they who are now renewing the site – adding a museum and trying to turn it into a tourist attraction. It feels really cold, although the weather outside is hot. “Be careful. 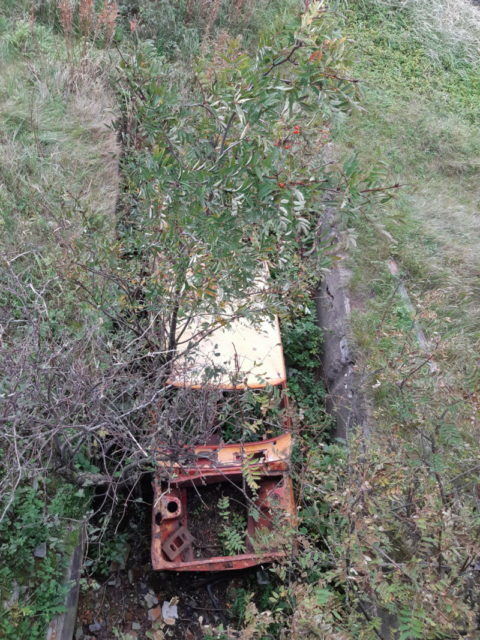 The floor is slippery, and there might be holes and unexpected steps everywhere,” warns Kirill. We literally plunge into darkness with our smartphone flashlights on and reemerge a dozen steps later in vibrating electric light. 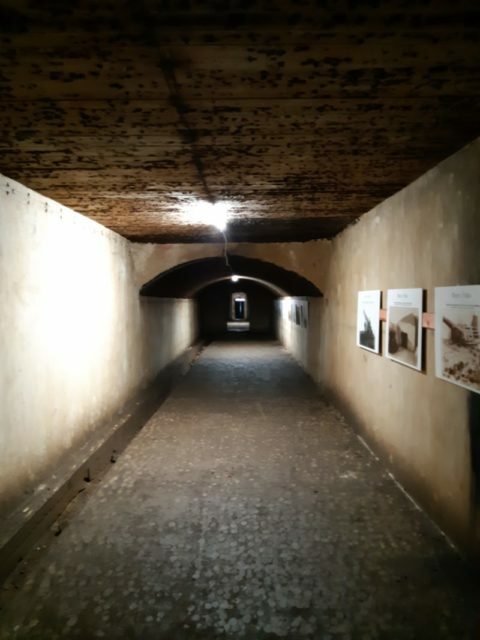 It becomes clear why Kirill was talking about the addition of electric lighting with pride: we see smooth concrete walls, narrow passages, moisture, and iron doors eaten by time and cut out by metal hunters. It was not an easy task to struggle through such conditions, so we could relate to him explaining the feeling our ancestors once had: that of seeing an electric bulb lit up for the first time. The first serious historical event in this area was documented in June 1705 when the Swedes attacked the shore where Reef Fort would eventually rise. The attack was pushed back by the Russians, and everything calmed down for two centuries. In 1890, Kotlin Island attracted the attention of Russian military authorities, and the story of the fort began. 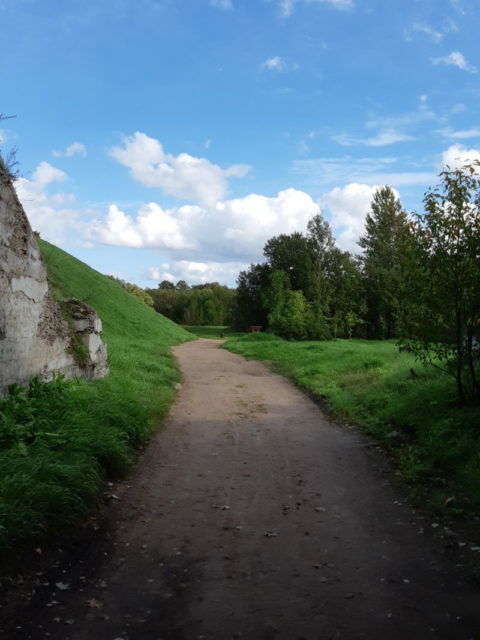 Kirill admits that it is not an easy matter to attribute exact dates to every building, so in certain cases it is safer to talk about the time frame between 1890 and 1907, when the “experimental campus” was built. Such “experimental campuses” were used to test both new weapons and the resistance of constructions to various missiles and explosives. Resistance properties were tested in what one would nowadays be labeled as “dangerous labor conditions” but which were normal at the time. 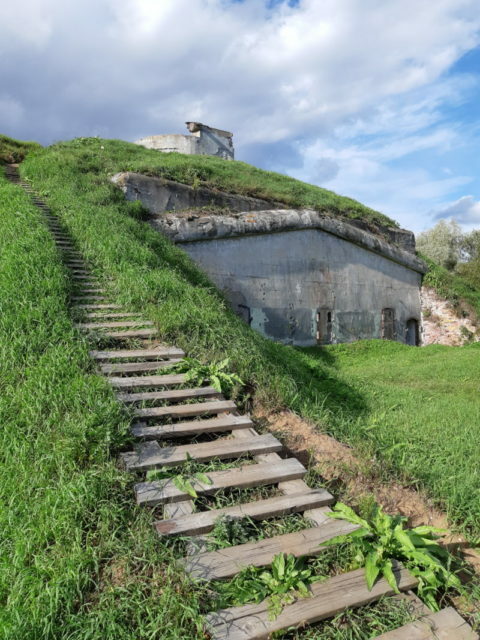 The fort itself was built in 1909-1911, six-eight years before the 1917 Russian Revolution. At this point, one might expect some breathtaking tales about the revolutionary fuss and the like, but bummer: no savory stories for you from this period. Some minor events were reported by the local press in 1919-1923, but they are not of particular importance. 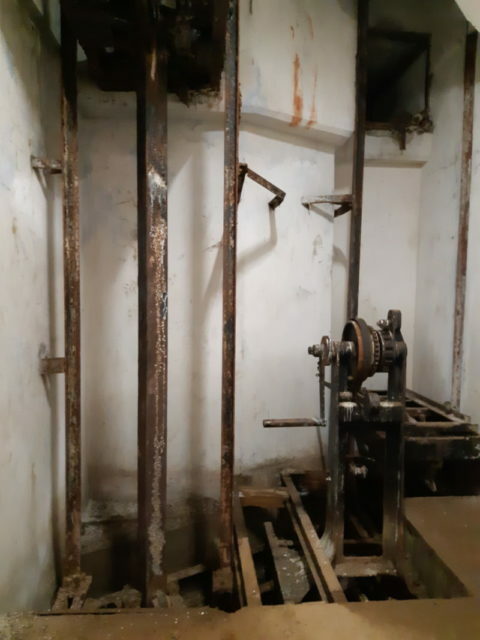 The 1930s saw the total re-equipment of the fort. 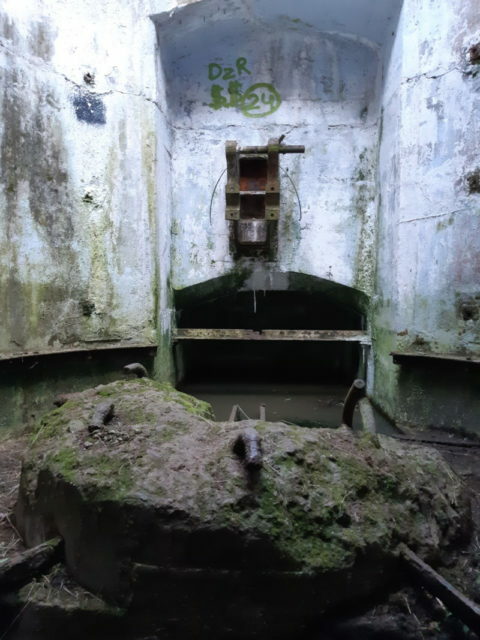 The new Soviet government constructed pillboxes (concrete block houses with loopholes through which to fire weapons) in the wake of the Second World War (1939-1945). 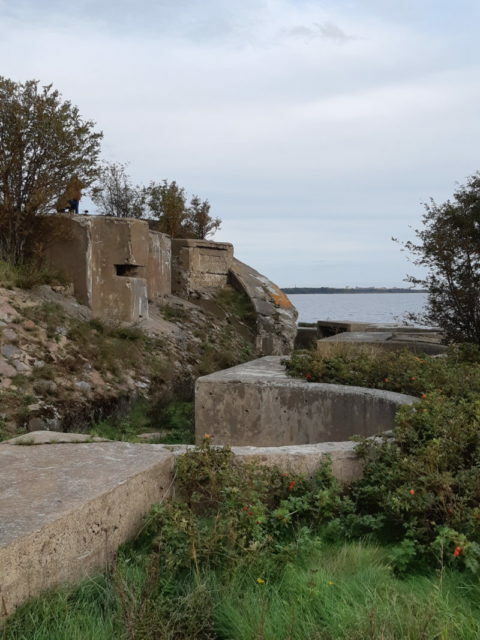 One curious fact is, however, linked to the thirties: the 1937 movie “Baltijcy” (“Baltic Warriors”) was shot in the fort, so one can catch rare glimpses of how everything looked almost a century ago (watch the movie from 30´ to 40´). Contrary to all expectations, the Second World War did not bring any heroic events to the place either. The bay in front of the fort was fully packed with mines, so no one dared approach the shore. The fort, on the other hand, played a very important humanitarian role. 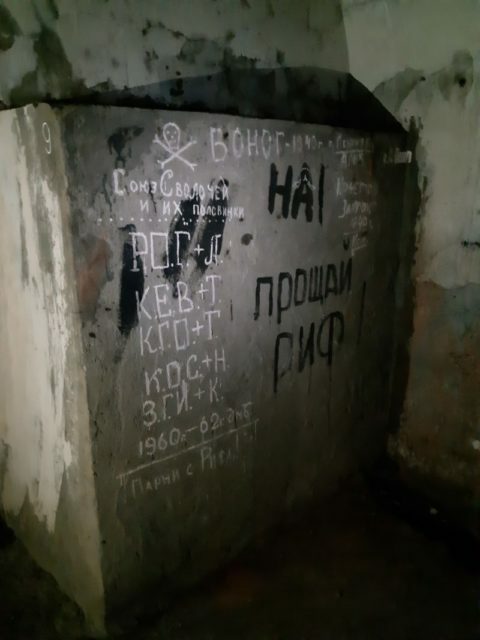 Children from Leningrad, which was sieged in 1941-1944, found shelter here. It was a safe remote place, and there was a possibility to grow food. 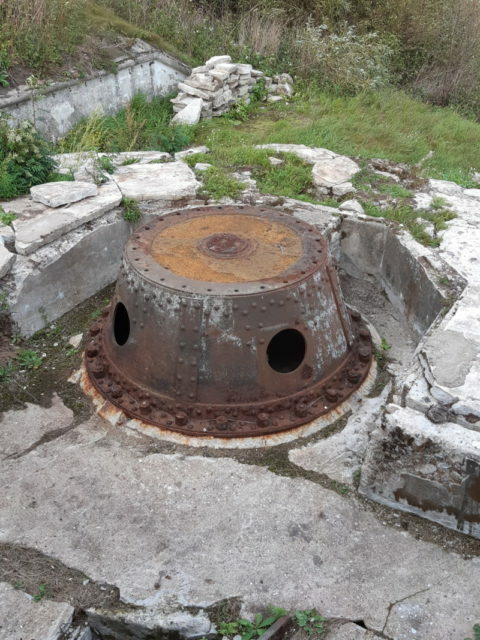 According to some documents, all of the seven legendary 152-mm Canet cannons were removed from the fort in 1948. Something counterintuitive happened in the 20th century though. Despite the fact that there were already many different ways and media available to document the events, two major legends linked to the site appeared, one of them still stirring the minds of adventure and wealth seekers. First: “The Emperor’s gold was treasured here in 1917 or 1918 after the unsuccessful attempt to ship it to Finland”. 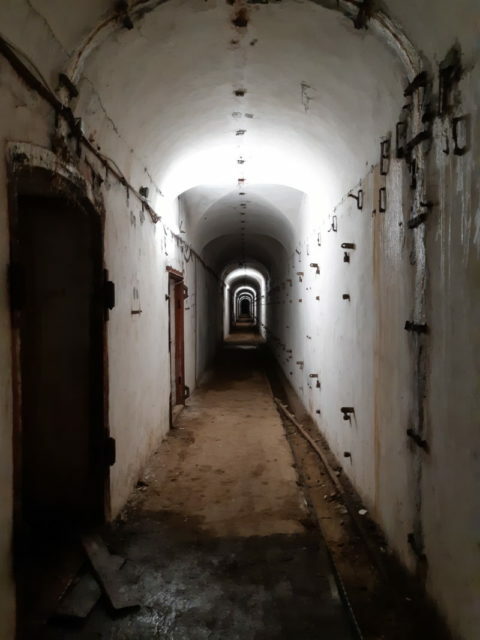 Black digging was only by force stopped as late as 2017 when the fort was closed for free access at last. This statement does not seem ungrounded as one considers the single-standing tower covered by the shrubbery. It really does not look like infrastructure for high-tension electric lines, especially because there are several miles of watery expanse on either side of the tower. 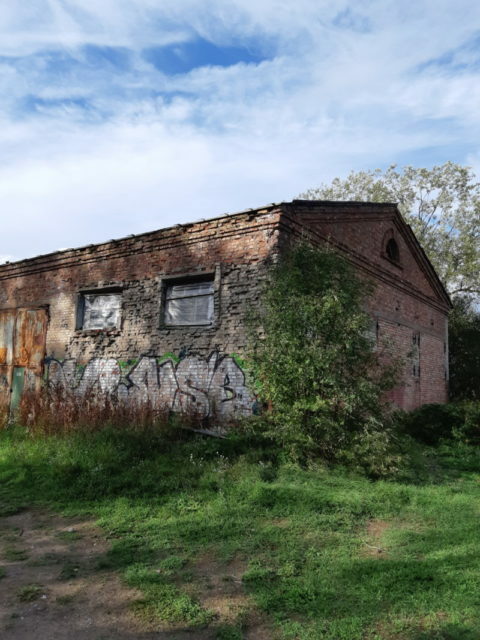 Kirill is dreaming of organizing a full-scale recreational and educational spot here. 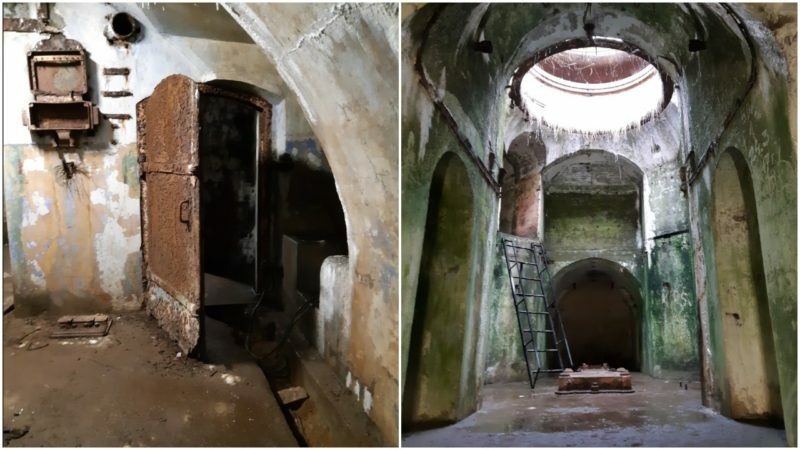 “It was a wise decision made by the Russian Ministry of Culture to lease cultural heritage in deplorable condition under the terms of the program known as ‘One-Rouble-Rent,’” he stated. “But the name really misguides many: it does not mean we paid one rouble to rent it. It was the starting price for the auction, and I still recall very vividly that it was postponed three times. Anyway, we received the fort in May 2017. It was in the state that one might call ‘picturesque ruins.’ Can you imagine my mixed feelings? Stanislav Vorobyev, editor in chief of the Russian specialized magazine on forts (“Fortoved”, lit. 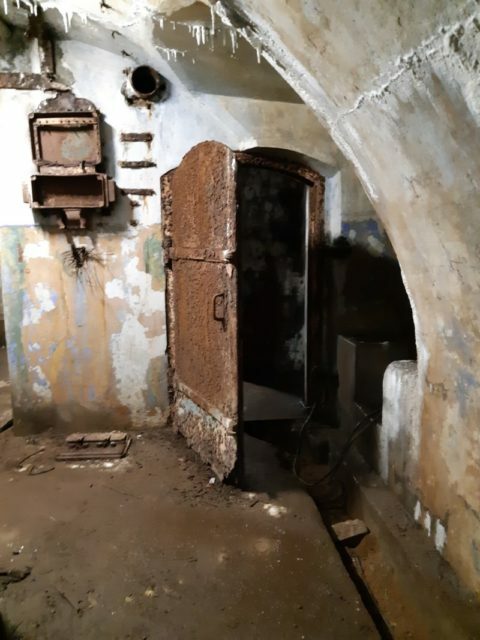 “Fort Connoisseur”) quit his official job later in 2017 to join Kirill’s team and become the leading scientific consultant on how works should be carried out. They went on studying scarce documents about the place. These were of great help, no doubt, but there still were some unexpected findings, like, for example, the sudden discovery of a huge staircase leading to the main entrance. Lost and found on a larger scale. Never mind, a pin or a staircase, everything will do. 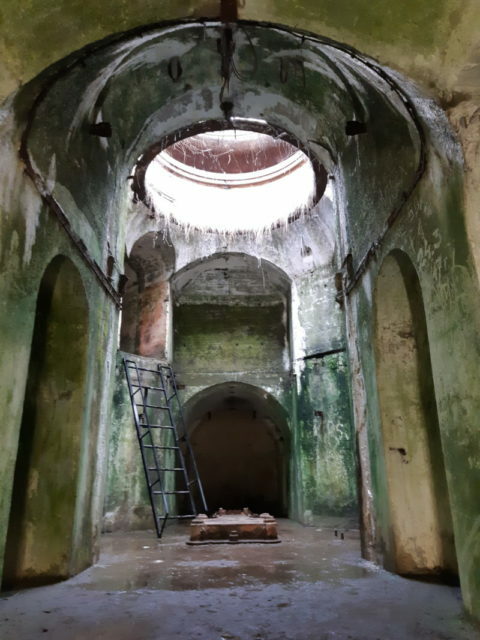 After being dug out and unveiled, the staircase completed the scenery, summing up the architect’s initial idea for it to approach the fort in the middle of the curtain wall and to lead the visitor to the then opulently decorated gate. “We can not, unfortunately, let people access the site freely now. The reason is the absence of written permission. The thing is that we still keep finding huge and deep holes in the ground that are hidden by high-growing grass. Such holes can run as deep as 40 feet. To drive away the fright, the fort superintendents like telling funny stories about people trying to access the site despite restrictions. At 4 am, a person looking somewhat like a modern saint had once shown up in front of the security cubicle claiming he had an “appointment” in the fort. -John of Kronstadt [Saint Petersburg saint. — CityLion]. Although the person was not officially granted access, he was spotted some half-an-hour later on the fort roof. He then just disappeared. Hopefully, he found John of Kronstadt and not one more of those dreadful holes.